Ever wanted to have a stand-alone program that will prompt and login to Oracle and then chain your program? There are samples out there but these remain limited. The following code uses Runtime registry entries or workspaces to generate a list of available applications for the launcher to "chain" to once logged into Oracle. The latest Mertech drivers do have an automatic login feature that will popup, if you or your user tries to open a file whose rootname starts with "ORA_DRV". This works great, but sometimes it is just not sufficient. In most of my apps, I want to log in before anything in the app starts such as initialisation processes. This program will do the trick. Note that each "ChainTo..." entry is an entry in the combo-list in the panel above. Just create a directory, e.g. X:\Oracle_Login, and download the files listed below into it. Compile using either the default DFPath or the one listed above. 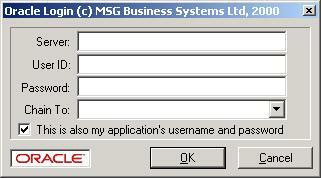 The resulting Oracle_Login.vd? can be launched from anywhere since it requires no data files. Note that the workspace, runtime key or VDF program name is in brackets. These "ChainTo..." values in the registry, are used to fill a combo form object in the launcher which provides a user-defined list of "chainable". This is important since the launcher extracts these from the filled combo form so it can launch the required application. programs. If Server, MyUserName and MyPassword are used, their values will appear in the launcher as a default. Server will be the Net8 or SQLNet TNSName you've created to connect to an Oracle database. As mentioned earlier, this is filled with entries from the launcher's registry settings. After successfully logging the user onto the Oracle database, the selected application in this combo form will be chained/activated. If you have checked this checkbox, the user ID and password used to login to Oracle will be added to the command line parameters of the application the launcher will "chain to". This is useful if you have a login panel on an application and you don't want users to have to login twice. You can simply change the launched application to pickup the username and password from the command line parameters supplied by the launcher and suppress the application's login panel if there is a successful login to the application. A sample shortcut for running the launcher with a default server, user and password. You can also download the complete sources as a zipped up package from VDF-GUIdance.